Caruana Galizia's killed .Allegations by her son of assassination , and as semtex has been found, highly likely. 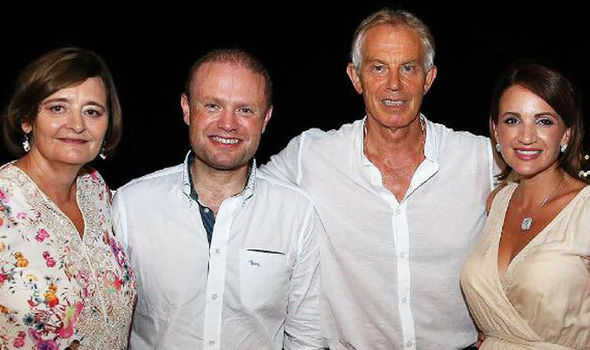 She was known for accusing top politicians of corruption, and connected Prime Minister Joseph Muscat to various corrupt practices and earlier this year linking him with the Pananma papers, which forced an early election. Yes, he won his election, and it turns out that his wife is also linked to shady dealings and off shore bank accounts.Claims have also arisen that there are passports being issued to Russians too ! Now in the first week of August this year, Joseph Muscat had his views about Brexit published. Not terribly flattering to UK , and quite resourceful in his knowledge by any standards ! He said: �Michel Barnier, our chief negotiator, showed me a huge file with all the details of how many cats and dogs cross from Calais to Dover every year and what are the complications that arise from Brexit on simply having a pet passport. " Mr Muscat was elected in June and anti-Brexit and quite convinced that Brexit would not happen. A week before the General Election and his re-election, there was a video broadcast to the thousands gathered at PL's mass meeting in Floriana . Now who do you think was giving the broadcast to endorse Muscat's re-election ? Saying he'd known Joseph Muscat for a while, and that he was an example of what a progressive politician can do in a country. Did you guess ? Yes, every ones friend Tony ! Just after his re-election off they all go on holiday together ! The fab four , taking a break and no doubt a few tips from Tony over a G & T. Muscat's words and prophecies just after his election about Brexit, seemed to be more like an echo from the bottom of Tony's glass. However, just thought it was a rather interesting scenario and wonder why Tony would be poking his nose in yet again. We must watch out to see where this knight in shining armour will travel to next. For sure, he's not sitting in his rocking chair yet, but he could be up for body parts soon. Would you want his body parts ? Last edited by granny; 18th Oct 2017 10:55pm.